Federated search allows you to run simple structure searches across multiple database tables, and then collate those structures into a single set in a new database table. These source tables are searched in turn allowing you to see how many hits there are in each data set. Once the searches have been run you can view the hits for each set or collate them into a new combined set. Federated search is an enterprise feature of IJC and requires a IJC Enterprise license key. Please contact sales at chemaxon dot com if you need a license key. Only data trees containing a JChem entity at the root of the data tree can be searched. Only the structure field can be searched. 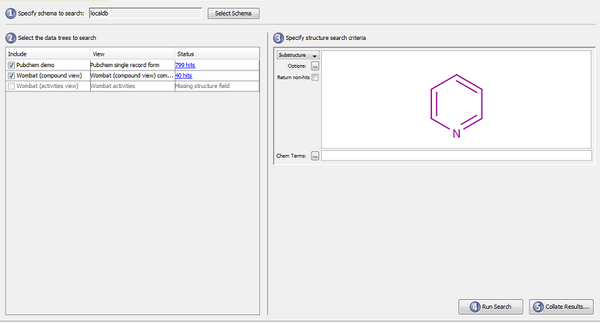 JChem tables of type REACTIONS cannot be searched as they need different search options. open the Simple Federated Search window using Window -> Simple Federated Search. Select the schema that you wish to search. The currently selected schema is chosen by default but you can change this. Specify which data trees you wish to search. By default all data trees that are searchable (see above) are selected. Exclude ones by unchecking the checkbox. Specify which view for each data tree that you want to be used to display the results. If the specified view is not the one you want you can change it by clicking on the cell in the table and choosing from the available views for that data tree. Once the search for that data tree has been run the hits for that data tree can be inspected in the specified view. Specify the structure search options. This is similar to how structure searches are specified in the query builder and the same options are available. Start the search by clicking on the 'Run Search' button. Each search will be executed in turn and the number of hits displayed. View the hits of each search by clicking on the hit summary hyperlink in the data tree selector. With the searches complete you can optionally collate them into a single data set. Click on the 'Collate results...' button to start this process. This will result in the structures being loaded into a new database table and an IJC entity, data tree and grid view created for that tables so that you can view all the hits. You will be prompted for which schema to load these structures into, the current schema will be the default as long as you have sufficient access rights to do this, otherwise you might need to choose your own local database. You can also specify a name for this data set (a default is provided based on the time that the search was run). You can also specify a name and a description for the new data. Sensible defaults are provided. Performing the collation will execute in the background, and when complete the collated structures plus some information on which data trees they came from is shown in the grid view. Once the collation is complete the grid view is opened for you to see the results.